How can we set the permission in a way that user who have responded should see only his responses in 'All responses' page and should be able to see all the responses of all other users in 'Graphical Summary page'. Person who has full control on the survey should be able to see responses of everyone on 'All responses' and 'Graphical summary page'. Friends. I need to filter the view based on 'Created By' column but that column is not present in the view filter drop down. Any idea why is it not there please suggest.Because if I get that column in the filter my issue will be solved. This is pretty straightforward as long as you have correct group permission inherited or added to this list. Go to Survey Settings -> Advanced Settings -> Modify 'Item level permission' like below and click OK. . It by design you don't have to worry. Reference: Article explains with detailed steps. 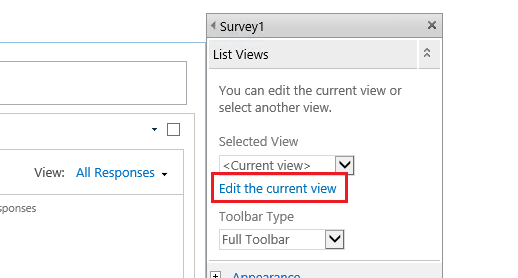 Setting item-level permission “Read responses that were created by the user” will apply to all items in the list, no matter which list view are using. List view is only for displaying items. Thus, both 'All responses' list view and 'Graphical Summary page' list view will only show items created by current user. It is impossible to make it affects only a specific list view. You can modify 'All responses' list view and add filter to show all items created by [Me]. Open Survey list > switch to 'All responses' list view. Edit the page and edit the web part. After that, user will only view his responses in 'All responses' page and he can view all responses in 'Graphical Summary page'. However, it also applies to user who has full control on the list. Not the answer you're looking for? 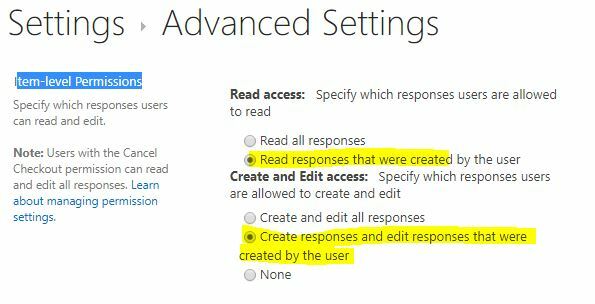 Browse other questions tagged sharepoint-server survey item-level-permissions or ask your own question. how to create a hyperlink for my field value? How to hide survey respones? 2013 Surveys - Want to restrict viewing answers, how to still have admin access to data?